For the final assignment, I was paired with Janelle. We chose to do separate designs that would still have the potential to work together given the chance. Janelle chose to do a fully illustrated backside, and I chose to do a sort of in-progress shot for the front side, using tactical materials that we are all so familiar with during our first semester. I chose to do this design for a multitude of reasons; I wanted to represent the class and our first semester here at IDEA, which has been full of traditional mediums and a multitude of paint splatters and construction paper scraps. I also wanted to honour the class’s humour, as we all have taken on a similar outlook as we’ve grown together through the months (yes, puns have become a common factor within the group, whether we like it or not). I wanted to depict a project mid-progress, including how messy and hap-hazard it was. I found myself searching for design solutions in this project in this exact way, and thought it would be nothing but appropriate to embody my ideas thus far. I chose the primary colour scheme to keep the eye pleased and at ease, while keeping each object emphasized and separate while all still remaining cohesive. 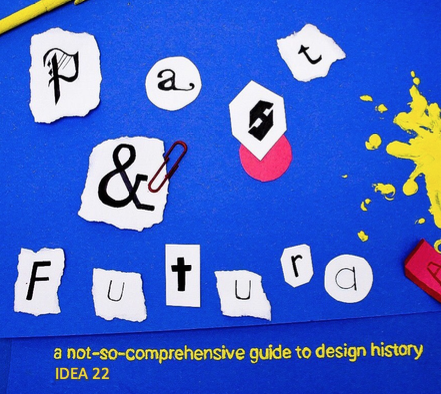 The title is of course a reference to the communications history course, and the heavy focus on fonts and type. Overall, although unplanned, I think mine and Janelles sides work nicely together. It’s as if the front cover is the class starting the project, and Janelles illustration on the back is the finished product. If I could change anything, I would suggest the two sides be more similar in their colour palettes. Janelle and I mostly depended on one another for critique and ideation, something that we both expressed that we struggled with. I was glad to work with her regardless of the more independent approach we used. The front and back covers we designed could be selected on their own and be a nice compliment to any other student’s work they could be paired with. Overall, I would grade myself as an 8/10. I like my concept, but again it could have been more integrated with Janelles. However, the image did turn out exactly how I envisioned, and I am very happy with the concept and work that I put into it. Breaking out into a non-illustrative design pushed my comfort zone a little, and I am proud of myself for that. For my final spread I was given an artifact to create from the era of the Bauhaus. 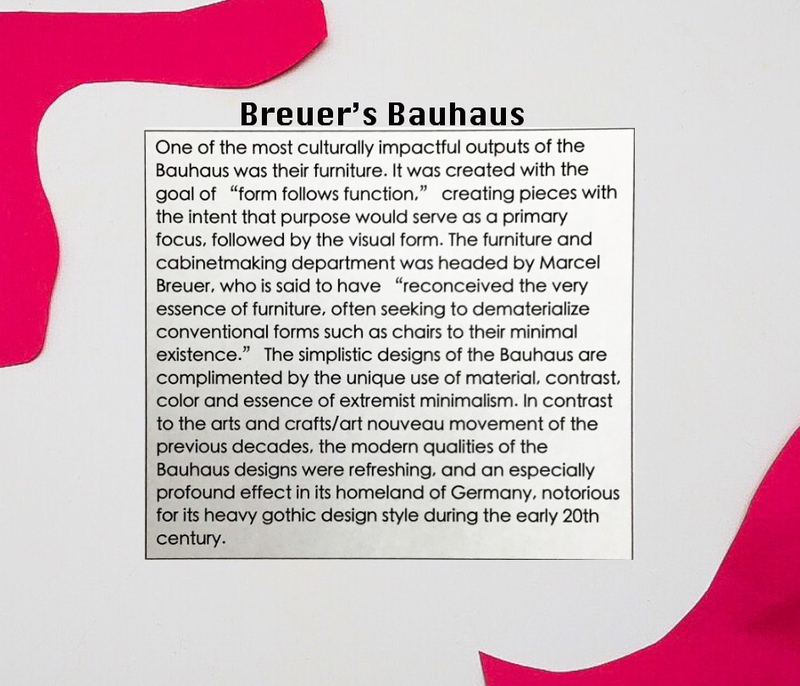 I chose to represent furniture created by Marcel Breuer, the teacher who led the cabinetry department and provided the bauhaus with the furniture that is so often sought after, even today. 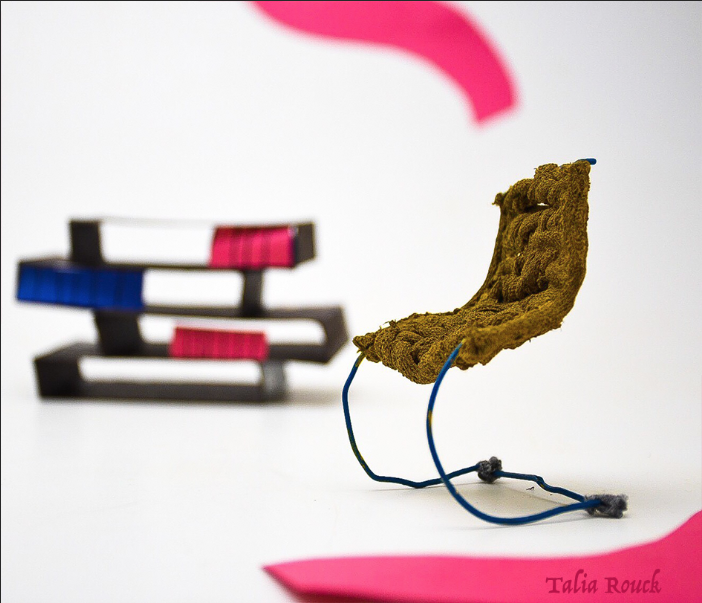 I constructed the chair out of a cut up sock, acrylic paint, paper clips, and lots and lots of gorilla glue. I wanted to represent the chair shown below. Breuer’s inspiration to utilize bicycle wheel designs in his furniture as well as the multi layered designs of his magazine racks caught my attention, and I wanted to focus on them in this spread. I wanted to include the organic red shapes to draw on the geometric branding of the bauhaus, as well as to “dirty the frame,” and pay homage to the primary colour palette the designers of the Bauhaus so often used. Looking back, I would give myself an 8/10, as the photos required a large amount of colour correcting, and I had to use a small amount of photoshop to insert the title and my name in the lower corner. Additionally, I think the magazine rack could have been executed in a more interesting way, and I could have included something on top of it to entertain the eye more. For this spread, we focused on women’s suffrage in the years 1905-1915. I wanted to contrast the typical feminine depiction of the Art Nouveau style of the time with the brazen determination of the Suffragettes. I had a couple of struggles with this layout–I forced myself to redo it three times. I knew that i wanted to depict a strong woman, but I kept running into barriers of how to illustrate it in a way that would do the cause justice, especially with the factor of the airy art nouveau colour scheme and whiplash curves. Finally I settled on the design attached here with some brainstorming help from classmates. I chose to have the suffragette large and featured across both pages, and vertically to make the figure stand out even more in her size. The blue background and text is symbolic of art nouveau as well as to introduce an aspect of stereotypical masculinity that the suffragettes were fighting against. I wanted this aspect to contrast with the idea of feminism and the character on the ride hand side. For my title, I used Arnold Boecklin Std Regular, a font that was typically used in decorative art nouveau posters. I would give myself an 8/10, simply because the text could have been done better, especially the area in the last paragraph where it bleeds onto the green of the bush. In regards to my spread, I’d like to say I did a good job. Considering that I am foreign to the idea of typography and type heavy design, I was very happy with the way that I was able to incorporate text and decorative elements in a way that resembled the crowded style of the book design era, but still keep things clear and concise. However, one thing that I would change would be the spacing between the border and between the sections of text. I used gouache to keep a color that was bright but not too overwhelming, and I modeled the whole concept after Fust and Schuffer’s “Latin mainz Psalter”, as well as William Caxton’s “Recuyell of the Histories of Troye”. For my spread I chose to focus on the style of decoration and type-dependent designs of the time, specifically those closer to the 18th century. The examples used in my blog post, Text me! are the primary inspirations for the illustrative styles. Each paragraph is done in the typographers most used or personal typeset to provide a viewer with the progression of text as the years passed. Nicholas Jenson done in the type face Jenson, and Fust and Shuffer’s paragraph is written in Frakture, the most commonly used font within their works.The text is displayed in a horizontal manner, each paragraph under a letter of DESIGN, since our topic assigned for this week was “Design and Type”. Each letter is customized to the typographer as well, giving the viewer a large-scale view of what their typeface looked like to really emphasize the difference between the two. This allows for the minute differences between them to be discerned easier. I included spot illustrations to provide information about the author without including more text than necessary. For Fust and Shoeffer, I included a small flower from the cover of The Latin Mainz Psalter, their first “Debut” into the printing world. Nicholas Jenson’s paragraph features his colophon below his set of text. William Caxton’s illustration is also his version of a colophon, a very ellaborate signature of “WXC”. 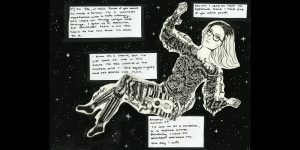 Geoffrey Tory’s paragraph includes a close up of a common figure used in the Champ Fleury, done in his signature line work interpretation of the human figure. Granjon’s includes another colophon of his, and Caslon’s includes a small design featured at the bottom of his type specimen sheet. 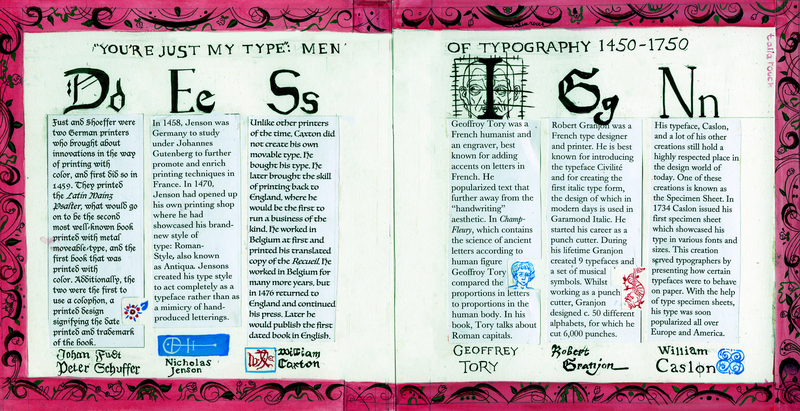 I chose to title it as “You’re just my type’: Men of typography 1450-1750” to keep such an academic and fact driven topic fun and lighthearted. I like to think that I am a very open book. I don’t spend a lot of my time concealing who I am. Instead, I choose to spend my energy bettering myself and others while remaining as true to who I am as possible. My design is an illustration heavy self portrait comprised of all the attributes that currently make me “me”. I chose to have the characteristics making up the parts of my body, as they are such integral parts of who I am. This ties into the idea of an “open book” as well. Everything I have to offer is right in front of you as long as you look. My torso is made up of plant matter due to my strong connection with nature and all living things. I love caring for nature and surrounding myself with it at all times possible. I have an extremely deep rooted and intense friendship with all things green and alive. In a way it literally makes up a huge part of me, spiritually and emotionally. I struggle to describe how it makes me feel, but communicating it this way feels right. I am made up of nature and its ornate complexity makes me beautiful the same way it makes the world beautiful. When compared to others this portion takes up the most of my body for this reason. Similarly, it is also the area that surrounds my heart. My legs are made up of various musical aspects, most prominently a guitar and/or ukulele. I grew up making music, and it is something that inspires me every day. My knees feature a rattlesnake twisted around them for two separate reasons. Similar to my torso, I feel a great connection to animals. However, rattlesnakes represent home for me as well. I grew up in Kelowna, where we have many beautiful animals but the most favorite of mine being the rattlesnake. 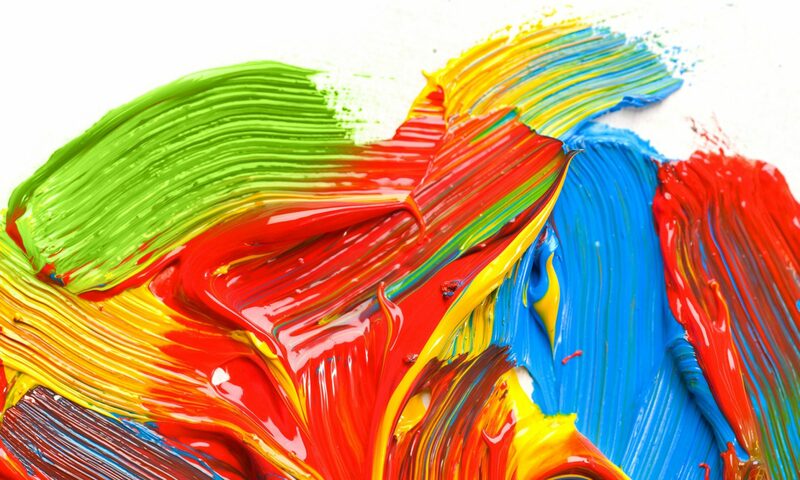 My feet are made up of paintbrushes, because art is what grounds me, specifically painting. All the images on the legs are ones that inspire me and keep me going, hence why they are my legs. I would give myself an 7.5/10. In my mind the illustration is done well, but the arrangement of the text and the formatting of it is lacking. Looking back the outline around the body is hasty, not to mention the issue of scaling. Next time I’ll make sure to format correctly and experiment with typography more.